Definition at line 34 of file CEvaluationNodeObject.h. Definition at line 41 of file CEvaluationNodeObject.h. Definition at line 34 of file CEvaluationNodeObject.cpp. Definition at line 40 of file CEvaluationNodeObject.cpp. Definition at line 49 of file CEvaluationNodeObject.cpp. 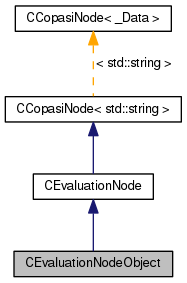 References CCopasiNode< std::string >::mData, CEvaluationNode::mPrecedence, CEvaluationNode::mpValue, pointerToString(), and PRECEDENCE_NUMBER. Definition at line 59 of file CEvaluationNodeObject.cpp. Definition at line 67 of file CEvaluationNodeObject.cpp. Definition at line 69 of file CEvaluationNodeObject.cpp. References C_FLOAT64, CN, CCopasiNode< std::string >::getChild(), CObjectInterface::getCN(), getData(), CExpression::getNodeObject(), CCopasiObject::getValueObject(), CObjectInterface::getValuePointer(), INVALID, CCopasiObject::isValueDbl(), CCopasiNode< std::string >::mData, mpObject, CEvaluationNode::mpValue, mRegisteredObjectCN, CEvaluationNode::mType, CEvaluationNode::mValue, POINTER, stringToPointer(), and CEvaluationNode::subType(). 90 // reference. For the math model to work this needs to be corrected. 132 return (getChild() == NULL); // We must not have any children. Definition at line 226 of file CEvaluationNodeObject.cpp. Definition at line 214 of file CEvaluationNodeObject.cpp. Definition at line 208 of file CEvaluationNodeObject.cpp. Definition at line 135 of file CEvaluationNodeObject.cpp. References CN, CCopasiNode< std::string >::mData, mRegisteredObjectCN, CEvaluationNode::mType, POINTER, and CEvaluationNode::subType(). Referenced by compile(), SBMLImporter::doMapping(), CReaction::object2variable(), SBMLImporter::renameMassActionParameters(), and SBMLImporter::setCorrectUsage(). Definition at line 197 of file CEvaluationNodeObject.cpp. References CCopasiObject::getObjectDisplayName(), mpObject, and mRegisteredObjectCN. Definition at line 164 of file CEvaluationNodeObject.cpp. Definition at line 390 of file CEvaluationNodeObject.cpp. References CMathObject::getDataObject(), CMathMl::getMMLName(), and mpObject. Retrieve the CN of the referred object. Definition at line 351 of file CEvaluationNodeObject.cpp. Referenced by CSBMLExporter::checkForUnsupportedObjectReferences(), CModelAdd::copyDelayExpression(), CModelAdd::copyEventAssignmentExpression(), CModelAdd::copyExpression(), CModelAdd::copyInitialExpression(), CModelAdd::copyTriggerExpression(), CExpression::createInitialExpression(), CODEExporter::exportExpression(), CSBMLExporter::findModelEntityDependencies(), CODEExporter::isModelEntityExpressionODEExporterCompatible(), CModelMerging::mergeInExpression(), test000093::test_bug1503_1(), test000093::test_bug1503_2(), test000047::test_delay(), test000024::test_hasOnlySubstanceUnits(), test000027::test_hasOnlySubstanceUnits(), test000028::test_hasOnlySubstanceUnits(), test000029::test_hasOnlySubstanceUnits(), test000041::test_hasOnlySubstanceUnits(), test000042::test_hasOnlySubstanceUnits(), test000030::test_hasOnlySubstanceUnits(), test000031::test_hasOnlySubstanceUnits(), test000032::test_hasOnlySubstanceUnits(), test000034::test_hasOnlySubstanceUnits(), test000035::test_hasOnlySubstanceUnits(), test000036::test_hasOnlySubstanceUnits(), test000037::test_hasOnlySubstanceUnits(), test000038::test_hasOnlySubstanceUnits(), test000039::test_hasOnlySubstanceUnits(), test000021::test_hasOnlySubstanceUnits(), test000022::test_hasOnlySubstanceUnits(), test000043::test_hasOnlySubstanceUnits(), test000082::test_import_delayAssignment_1(), test000082::test_import_delayAssignment_2(), test000082::test_import_delayAssignment_3(), test000082::test_import_delayAssignment_4(), test000082::test_import_delayAssignment_5(), test000082::test_import_delayAssignment_6(), test000082::test_import_delayAssignment_7(), test000082::test_import_delayAssignment_8(), test000064::test_import_event_assignment_expression_and_hasOnlySubstanceUnits_1(), test000064::test_import_event_assignment_expression_and_hasOnlySubstanceUnits_2(), test000064::test_import_event_assignment_expression_and_hasOnlySubstanceUnits_3(), test000064::test_import_event_assignment_expression_and_hasOnlySubstanceUnits_4(), test000064::test_import_event_assignment_expression_and_hasOnlySubstanceUnits_5(), test000064::test_import_event_assignment_expression_and_hasOnlySubstanceUnits_6(), test000064::test_import_event_assignment_expression_and_hasOnlySubstanceUnits_7(), test000064::test_import_event_assignment_expression_and_hasOnlySubstanceUnits_8(), test000095::test_import_l3_event_1(), test000095::test_import_l3_event_2(), test000095::test_import_l3_event_3(), test000095::test_import_l3_event_4(), test000095::test_import_l3_event_5(), test000087::test_import_reaction_flux_reference_2(), test000064::test_import_rule_expression_and_hasOnlySubstanceUnits_1(), test000064::test_import_rule_expression_and_hasOnlySubstanceUnits_2(), test000064::test_import_rule_expression_and_hasOnlySubstanceUnits_3(), test000064::test_import_rule_expression_and_hasOnlySubstanceUnits_4(), test000064::test_import_rule_expression_and_hasOnlySubstanceUnits_5(), test000064::test_import_rule_expression_and_hasOnlySubstanceUnits_6(), test000064::test_import_rule_expression_and_hasOnlySubstanceUnits_7(), test000064::test_import_rule_expression_and_hasOnlySubstanceUnits_8(), test000087::test_simulate_reaction_flux_reference_1(), toAST(), and CModelExpansion::updateExpression(). Definition at line 354 of file CEvaluationNodeObject.cpp. Referenced by CModelExpansion::expressionContainsObject(), CModelExpansion::replaceInExpression(), and CModelExpansion::updateExpression(). Definition at line 359 of file CEvaluationNodeObject.cpp. Definition at line 220 of file CEvaluationNodeObject.cpp. Definition at line 153 of file CEvaluationNodeObject.cpp. References CN, CCopasiNode< std::string >::mData, mRegisteredObjectCN, CEvaluationNode::mType, and CEvaluationNode::subType(). Referenced by CModelAdd::copyDelayExpression(), CModelAdd::copyEventAssignmentExpression(), CModelAdd::copyExpression(), CModelAdd::copyInitialExpression(), CModelAdd::copyTriggerExpression(), CExpression::createInitialExpression(), CModelMerging::mergeInExpression(), SBMLImporter::renameMassActionParameters(), CModelExpansion::replaceInExpression(), and CModelExpansion::updateExpression(). Definition at line 364 of file CEvaluationNodeObject.cpp. References CN, CCopasiNode< std::string >::mData, CEvaluationNode::mpValue, CEvaluationNode::mType, POINTER, pointerToString(), and CEvaluationNode::subType(). Converts this node to an ASTNode. Definition at line 247 of file CEvaluationNodeObject.cpp. References fatalError, CCopasiNode< std::string >::getChild(), CCopasiParameter::getCN(), CCopasiDataModel::getDataObject(), CModel::getInitialTime(), getObjectCN(), CCopasiObject::getObjectName(), CCopasiObject::getObjectParent(), CModelEntity::getSBMLId(), CReaction::getSBMLId(), CCopasiObject::isReference(), MCSBML, mRegisteredObjectCN, CEvaluationNode::toAST(), and CCopasiMessage::WARNING. 269 // assume that it will always be the current global model. Definition at line 187 of file CEvaluationNodeObject.h. Referenced by compile(), getDisplayString(), getMMLString(), and getObjectInterfacePtr(). Definition at line 192 of file CEvaluationNodeObject.h. Referenced by compile(), getData(), getDisplayString(), getInfix(), getObjectCN(), setData(), and toAST().